Rolo in the Middle! | Rosetta Bakes! The dough part on this cookie is the same as a cookie recipe I’ve posted before called: “Magic in the Middle,” but instead of the peanut butter center, I decided to use a Rolo instead. Once the cookie cools, the Rolo inside becomes more solid again. The chewy center is an unexpected surprise! 1 bag of Rolos…that’s it! 2. Lightly grease baking sheets (I use parchment paper). 3. To make the dough: In a medium-sized bowl, whisk together the flour, cocoa, baking soda and salt. In another medium-sized bowl, beat together the sugars, butter and peanut butter until light and fluffy. Add the vanilla, egg, and egg yolk, beating to combine, then stir in the dry ingredients, blending well. 4. To shape the cookies: Scoop 1 Tablespoon of the dough. Make an indentation in the center with your finger and place one Rolo into the indentation. Bring the cookie dough up over the filling; pressing the edges together to cover the Rolo; roll the cookie in the palms of your hand to smooth it out into a ball. 6. Repeat with the remaining dough and filling. 7. 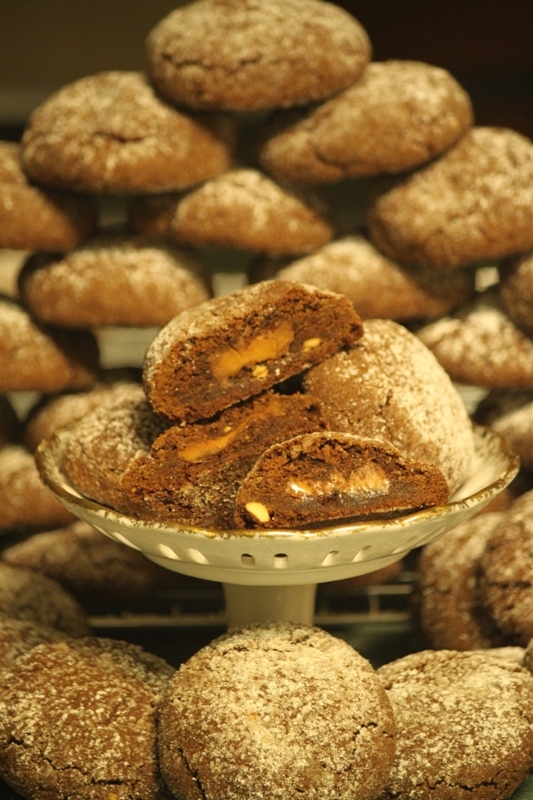 Roll each cookie in granulated sugar and place on the prepared baking sheets; leaving about 2 inches between each cookie. 8. Bake the cookies for 10 to 12 minutes, or until they’re set and you can smell chocolate. 10. Remove them from the oven and cool on a wire rack. * When cool, I dust the cookies with confectioner sugar. Great Idea…they sound delicious, I just might make these for the children’s lunch boxes. I’m going to have to substitute the peanut butter for something else due to allergies. Thanks Yvette! You might want to substitute soy nut butter (made from soy beans) for the peanut butter. This is supposed to be a great substitute for those who are allergic to peanut butter. If you make them with the soy nut butter, let me know how they turn out.